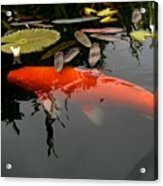 Koi Fish 4 by Marta Robin Gaughen - 8.000" x 6.000"
Koi Fish 4 framed print by Marta Robin Gaughen. Bring your print to life with hundreds of different frame and mat combinations. Our framed prints are assembled, packaged, and shipped by our expert framing staff and delivered "ready to hang" with pre-attached hanging wire, mounting hooks, and nails. There are no comments for Koi Fish 4. Click here to post the first comment. Accidental Artist, Registered Dental Hygienist and part-time Mermaid residing near/in the waters off San Diego, California. 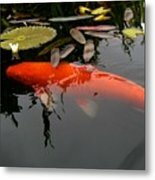 Specializing in the Photographic Arts, and Original Acrylic and Watercolor Paintings. Some originals of the paintings are available for purchase. Please ask. Enjoy...look around. If my art speaks to you, I would be honored if you are inspired to purchase a print, a card, or perhaps the original, but please don't use any of my images on websites, blogs or other media without my explicit permission. All rights reserved. If you'd like to use one of my images for any reason, please contact me.